I feel like I am always seeing these great outfits in the magazines and on websites that seem so achievable until you see the price tag! I thought it may be fun to try and do a "look for less" post, featuring a pricey look with some less expensive, but similar options! These are some options to replace for the pricey originals! As much as I LOVE Wildfox clothing and Citizens of Humanity jeans seem soo comfortable, the prices make them pretty difficult to buy. There are always less expensive options out there that give you a very similar look! 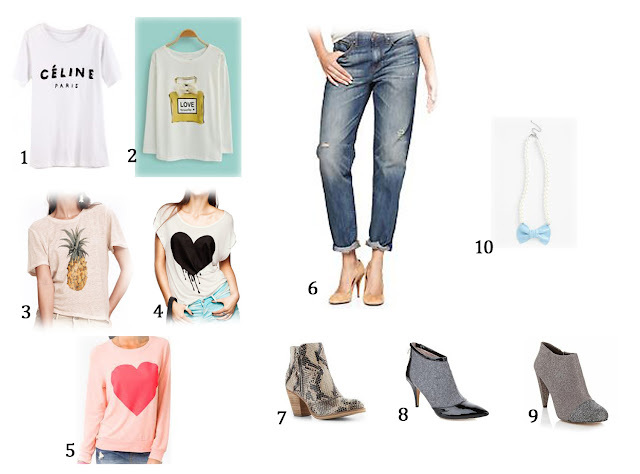 For the tops, I chose graphic tees that are basically simple but feature one, focus object. I tried to keep it to light colors like whites and pinks and keep the feature objects feminine to resemble the Wildfox tee. The jeans were a much easier find, these boyfriend jeans from Gap are almost identical to the COH ones, and for a fraction of the price! The shoes were also really tricky. The first, snakeskin, bootie captures the visual texture that the Tildon bootie has. The second one has the darkened tip, like the original, and the same color scheme, but a much thinner heel. The last bootie has a thicker heel and the darkened tip, but has a shimmery finish. I kept the same necklace because its quite affordable at $32! Sweet + Simple Prom Makeup! Inject Volume Into "Dirty"/Flat Hair!